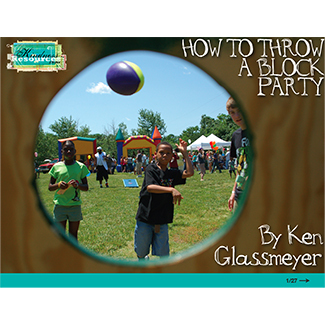 One of the best ways to connect with your community and show them God's love in a practical way to throw a block party! Learn the nuts & blots of how to properly throw a block party from Ken Glassmeyer, someone who has been responsible for organizing these parties for more than 20 years. FOOD. . . FUN. . . FREE! I grew up in a town that is known for parties. In fact, according to USA Today, my city has more food and beverage inspired events than any other city in the world, but we are also the most overweight city per capita, so it probably isn’t something we should brag about. I was raised Catholic. One of the staples of that experience is the summer festival. When you are young, you grow up thinking your parish is the only game in town. As you grow older, you realize that there are at least three major church festivals going on in the city on any given weekend throughout the region that attract hundreds if not thousands of people. That does not include the many secular events throughout the summer such as Oktoberfest, Bockfest, or Riverfest. Another realization occurred to me as I matured is that while on the surface these events seemed mostly about community, they were actually about fund raising and networking. Who doesn’t enjoy a purposeful conversation with a fellow church member over bratwurst and cold drink? Later when Jesus was eating supper at Matthew's house with his close followers, a lot of disreputable characters came and joined them. When the Pharisees saw him keeping this kind of company, they had a fit, and lit into Jesus' followers. "What kind of example is this from your Teacher, acting cozy with crooks and riffraff?" Jesus, overhearing, shot back, "Who needs a doctor: the healthy or the sick? Go figure out what this Scripture means: 'I'm after mercy, not religion.' I'm here to invite outsiders, not coddle insiders."